Treat your car with the gentle touch it deserves! Speed Master has done it again with the Speed Master Car Wash Brush! Crafted using a premium synthetic fiber that mimics the look and feel (without the exorbitant cost!) of genuine hog hair, the Speed Master Car Wash Brush allows for the safe removal of surface contamination during a car wash. With fibers measuring 3 inches all around, the Speed Master Car Wash Brush pulls contaminants from the surface and “stores” them close to block – and away from your paint! Wash large vehicles like trucks, vans, SUVs, and RV as easily as you would wash a car with the Speed Master Car Wash Brush! With the use of microfiber and terry cloth wash mitts on the rise, it’s easy to forget about car washing brushes – but not anymore! The Speed Master Car Wash Brush brings you back to the car washing basics with the super-soft bristles that gently clean your car, truck, SUV, RV, or even boat! Designed to be used with a telescoping handle, the Speed Master Car Wash Brush eliminates the need for ladders, stools, and bending! The Speed Master Car Wash Brush cleans all of your exterior surfaces with ease. Washing the roof of your car has never been easier! Speed Master Car Wash Brush is “multi-level”, meaning it curves around to allow for more surface coverage! 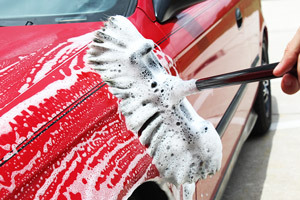 Many car wash brushes use a genuine hog hair fiber that tends to deteriorate after just a couple uses. The Speed Master Car Wash Brush uses a premium synthetic fiber to mimic the look and feel of hog hair, but with more durability! The 3 inch fibers provide the necessary cushion and dirt trapping capabilities to avoid washing-induces swirls and scratches. Washing your car doesn’t have to be back-breaking work – use the Speed Master Car Wash Brush to safely clean your whole vehicle, no matter the size! Directions for use: It is recommended that the bristles be allowed to “soak” in your wash water for 5-10 minutes before use to soften them and create more pliability. Use the Speed Master Car Wash Brush with the Telescopic Handle or the Heavy-Duty Stainless Steel Telescopic Handle. Add the Telescopic Handle to your order for just $10 more when you purchase the Speed Master Car Wash Brush – just select it from the drop down below!